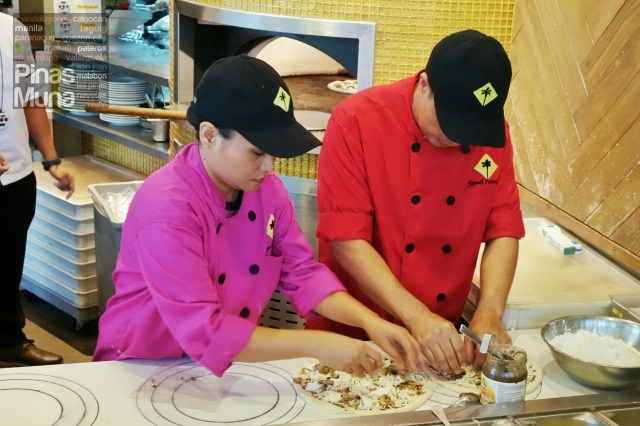 California Pizza Kitchen (CPK), an international casual dining restaurant chain specializing in California-style pizza, gathered all its cooks in the Philippines in a competition that would bring out the talent and creativity in every participant. 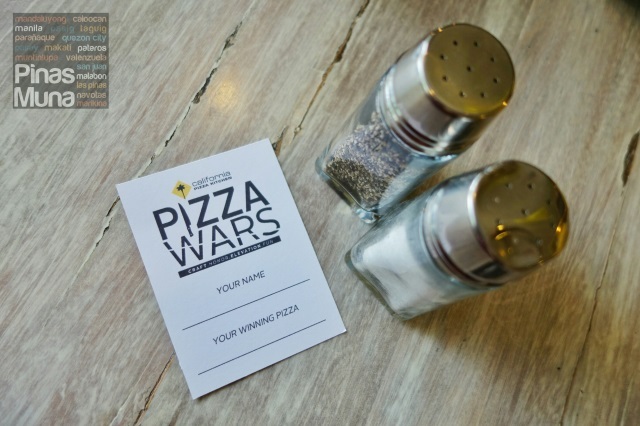 CPK's Pizza Wars is an annual competition held in the United States participated by CPK's domestic branches. 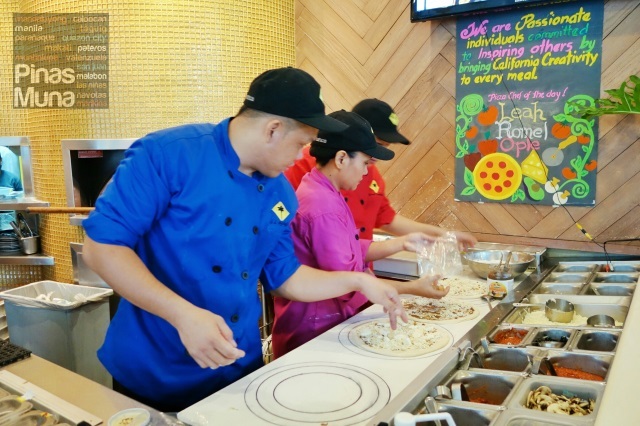 Recognizing the talent and skills of its Filipino counterparts, CPK finally launched the first ever Pizza Wars competition in the Philippines, the first of its kind in the Philippines and outside the United States. 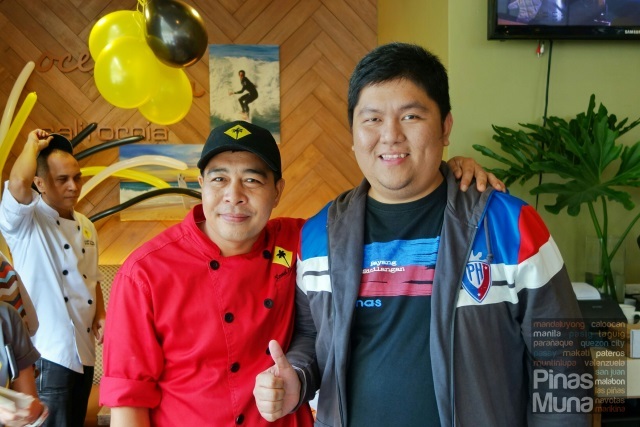 From the ten participating CPK branches in the Philippines, only three pizza chefs made it to the finals which was held last June 9 at CPK's Bonifacio Global City branch. Team Pinas Muna had the privilege of witnessing the finals where the top 3 pizza chefs showcased their creations through a pizza making demonstration followed by a pizza tasting session. Representing the CPK Eastwood branch was pizza chef Lea Castillones who presented her Steak with Mushroom + Truffle Pizza. 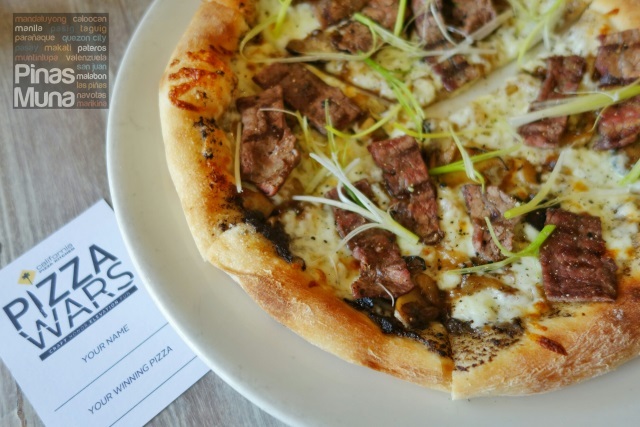 For her pizza, she used truffle oil as base, topped with caramelized yellow onion, abalone mushrooms, shiitake mushrooms and button mushrooms, shredded mozzarella, chunks of fresh mozzarella and finally topped with tender and juicy grilled steak. 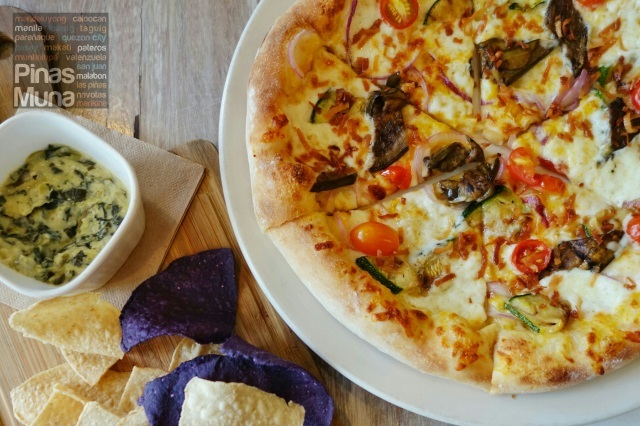 From CPK Alabang was pizza chef Romel Panaligan who presented his Filipino-inspired vegetarian pizza, The Farmer's Choice, which is a celebration of the abundant produce of our farmers. Roasted squash, coconut milk and cinnamon was turned into a puree which made for a very interesting and unique base for a pizza. It is then topped with shredded mozzarella, chunks of fresh mozzarella, slices of grilled eggplant and zucchini, cherry tomatoes and sprinkled with desiccated coconut. Finally, pizza chef John Cloe Oplejeda of CPK TriNoma added a sweet note to the pizza cook-off with his dessert pizza which took inspiration from the King of Rock & Roll favorite sandwich. The Elvis has sweet peanut sauce as base which is then topped with chunks of fresh mozzarella, slices of fresh bananas, sprinkled with crispy bacon bits and candied walnuts, baked and then drizzled with peanut sauce and topped with peanut butter gelato. 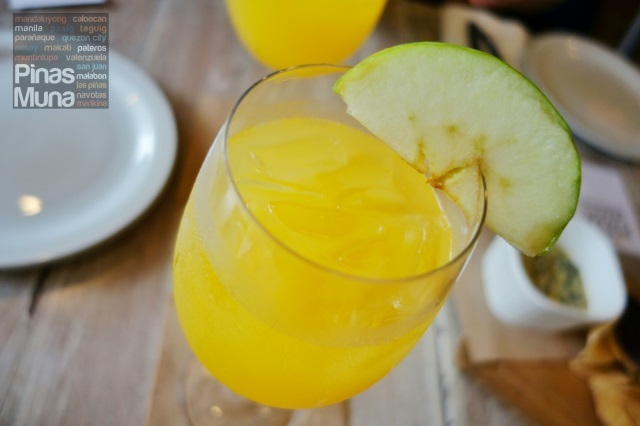 During the food tasting session, we also got to try CPK's new White Mango Sangria, a blend of Chardonnay and mango juice. It's perfect with all the pizza variants we tried that afternoon. A short Q&A followed the food tasting session where members of the press were given the opportunity to ask the chefs. 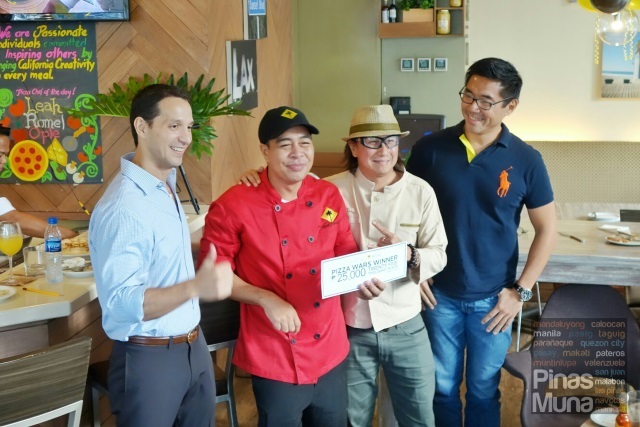 Judging the first ever CPK Pizza Wars in the Philippines were GRCI President & CEO Mr. Archie Rodriguez, Celebrity Chef Rolando Laudico, and GRCI CFO Mr. Griffith Go. Pizza Chef Romel Panaligan was proclaimed winner and took home a cash prize of P25,000. It was a tough choice to make. The scores of the three competing chefs were only apart by 1 point, but it was the creativity and innovation of pizza chef Romel Panaligan that gave him the advantage. Chef Romel's bold choice of ingredients for his squash puree pizza base embodies the innovative and exceptional pizza flavors that CPK is known for. 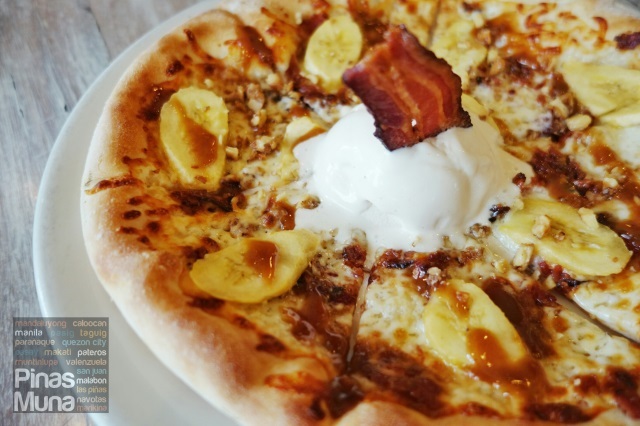 Chef Romel's Farmer's Choice Pizza will be featured in CPK's annual celebration of National Pizza Day in August 2015 and will also be included in CPK Philippines new menu which is scheduled to be rolled out in the last quarter of this year. For updates on the latest offerings of CPK Philippines, you can follow them on Facebook (fb.com/CPKPhilippines) or on Twitter or Instagram @CPKPhilippines. CPK Philippines has branches at Greenbelt 5, Shangri-La Plaza, Greenhills Promenade, Eastwood, Rockwell, Bonifacio Global City, Mall of Asia, Alabang Town Center and Century City Mall.